When it comes to pickup trucks, we know that Middletown and Mechanicstown drivers know that the 2014 Honda Ridgeline is one of the best, most versatile choices available. You can get behind the wheel of the new Ridgeline now at Middletown Honda, but we know that you’ve probably been shopping around for pickups for a while and have seen some competing trucks. We think the Ridgeline comes out on top, but we figured you could use a direct comparison to show you what Honda’s pickup has to offer. Let’s see how the 2014 Nissan Frontier stacks up. Honda’s Ridgeline has a history of giving drivers what they want, and the 2014 model is no different. While many truck drivers are at least familiar with a manual transmission, the fact is that having a vehicle with an automatic transmission, like the Ridgeline, makes it easy for anyone to drive. Drivers can get an automatic transmission on the Frontier, but it does not come standard. Honda’s pickup is also built for versatility, featuring plenty of cabin room as well as a rear stabilizer bar and rear locking differential for improved control and traction. The stabilizer bar and locking differential are unavailable on the Frontier, and their cabin comes with less front and rear head room, less front hip room, and less second-row leg room. Not only do you get more room in the cabin of the Ridgeline, but you’ll be able to haul more too, with a maximum payload of 1537 pounds; the Frontier can only carry 1457 pounds. Of course, these advantages don’t seem too out of the ordinary when you consider that the Ridgeline has been designed with the driver in mind, built to be a mixture of an SUV and a pickup—featuring the advantages of both—while the Frontier is just a truck like many of the rest. 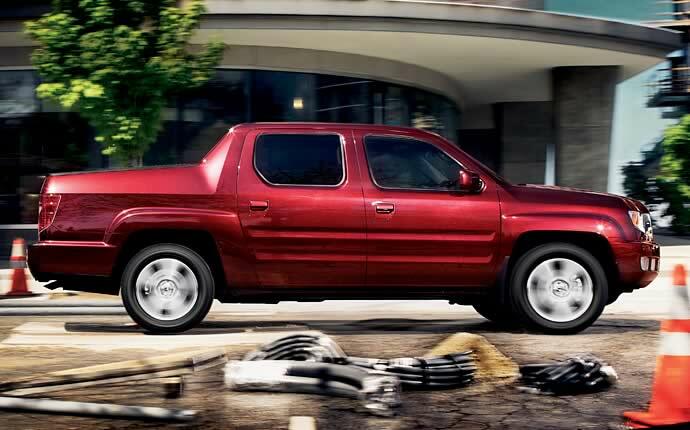 The facts don’t lie, but we know that sometimes you need more than the facts to make a decision on something as important as a new pickup, so we invite you to visit Middletown Honda and take the 2014 Honda Ridgeline for a spin. Don’t blame us if you have a hard time getting out of the driver’s seat, though; you wouldn’t be the first one.